CHICAGO – If you hear an unusual sound this weekend, it may be Jules Verne, Robert Louis Stevenson, and Jonathan Swift spinning in their graves. The writers who have become an essential part of any growing person’s library have now been associated with a piece of 3D junk that insults the intelligence of everyone who sees it. “Journey 2: The Mysterious Island” is not a trip worth taking. I know what some of you are already thinking. I’m being too hard on it. It’s a kid’s movie. It’s 3D fun and if it introduces some great authors to another generation than this cynical critic is being predictably belligerent. I wish I could agree. I would love to support a “dumbed down” version of classic fiction that might get young viewers doing something that seems increasingly uncommon – cracking a book. But does it have to be this far down? And this dumb? There’s a way to make a movie like “The Mysterious Island” that appeals to people who know the work of Verne and those more excited by seeing The Rock or Vanessa Hudgens. But “Journey 2” insults them all with horrendous writing, cheap effects, and silly storytelling. It turns brilliance into nonsense. 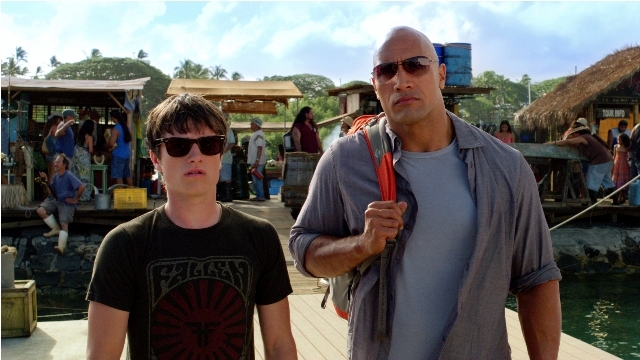 Read Brian Tallerico’s full review of “Journey 2: The Mysterious Island” in our reviews section. Sean (Josh Hutcherson) still remembers the crazy journey he took with his dad in “Journey to the Center of the Earth” but pop is missing in action (it’s hard to say what Brendan Fraser had to do that was better but maybe he finally came to his senses in terms of paycheck roles after “Furry Vengeance”) leaving stepdad Hank (Dwayne Johnson) to struggle with the troubled teen, who really wants nothing to do with him. As the film opens, Sean has just received a message that he believes is from a Vernian (someone who, like Sean, believes that the works of Jules Verne were non-fiction). Hank helps him translate the message, which reveals that the location of the legendary mysterious island of Verne’s book has been found. Time for an adventure! Before you can say, “Doesn’t this kid have to go to school,” the pair are off to Palau, where they hire a helicopter piloted by the aggressively annoying Gabato (Luis Guzman) and his gorgeous daughter Kailani (Vanessa Hudgens). The quartet fly into a hurricane and crash land on the legendary island, where they find Sean’s grandfather Alexander (Michael Caine). Before they can get accustomed to the tricks of the island, they discover it’s sinking, and so the whole movie becomes an escape mission. Go to the island, get off the island, try to do something interesting on the journey. Continue reading for Brian Tallerico’s full “Journey 2: The Mysterious Island” review. “Journey 2: The Mysterious Island” stars Dwayne Johnson, Josh Hutcherson, Luis Guzman, Vanessa Hudgens, and Michael Caine. It was directed by Brad Peyton and hits theaters on February 10th, 2012. It is rated PG. Submitted by JACK (not verified) on February 28, 2012 - 9:26pm. YOURE AN IDIOT..I DON’T HAVE KIDS, AND ME AND MY WIFE THOUGHT IT WAS GREAT!